In the Willamette Valley, a home receives as much solar energy annually as the US average. You can sell excess energy in the summer and use the grid in the winter. Did you know that the amount of sunlight that strikes the earth's surface in an hour and a half is enough to handle the entire world's energy consumption for a full year? Solar energy has surprising potential to power our daily lives thanks to constantly-improving technologies. A wide variety of technologies are available for heating and cooling homes and other buildings. In addition, many heating and cooling systems have certain supporting equipment in common, such as thermostats and ducts, which provide opportunities for saving energy. 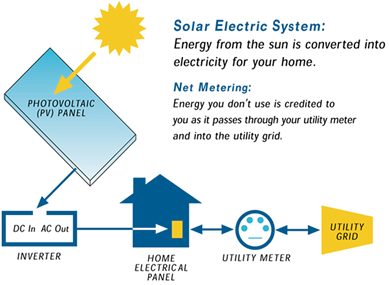 Your solar electric system is connected to your power company (PGE, Pacific Power, EWEB or CPI). You generate clean energy for your use and sell any excess back to your utility. When you generate less energy than you require, your utility provides you power. It's a hybrid system that provides you the benefits of solar energy and the security of utility power. Many individuals interested in investing in a solar system also explore ways to increase the energy efficiency of their home or business.Every $1 invested in energy efficiency, typically saves $3-5 on solar electric system cost.